In the huge catalog of chess variants that this website is, the present deserves its own place with a suitable name that help us to find it quickly. In 1982 I returned to Villahermosa after spending five years in Mexico City studying mathematics and philosophy at the National Autonomous University of Mexico. I must say that I did not graduate in any of these two fields of knowledge. Then I decided to dedicate myself to studying and playing chess. At that time I did not know that chess variants existed, except that a friend had told me about the so-called Cylindrical Chess. One good day of the 1983 year I discovered (without having been influenced by anything nor anyone) the initial symmetrical position that is generated when the king is flanked by two queens. So great was my impression when contemplating such a beautiful setup that I immediately considered as "a lesser evil", as "a minor problem" the fact that both bishops of each side fell into squares of the same color, issue that it could undoubtedly be solved satisfactorily. It was thus that I conceived The Bishops Conversion Rule (BCR). For 15 years I played symmetrical chess on a 9x9 board applying the BCR without knowing if someone else would be doing the same thing in another place of the world. At the beginning of 1998 I went to the internet for the first time and, thanks to this wonderful website founded by Hans Bodlaender [The Chess Variant Pages], I knew that there was a variant very similar to mine proposed in 1975 by Mr. Michael J. Corinthios called Ministers Chess, but he did not do anything to solve the problem of bishops, so both proposals differed ENOUGH one from the other; however Mr. Corinthios protested when Hans published my proposal arguing that he had patented his idea. Hans declined to enter into discussions and chose down the page and in place kindly wrote and posted a special page explaining only the BCR. After this sultry incident about patents and copyrights badly understood, I went in a kind of hibernation for about other 15 years!, which made it possible for my mind to gradually settle the conviction that it was necessary to go from the 9x9 board to the 9x8 in order to make the gameplay as close as possible to the traditional 8x8. So now I return with new vigor to the promotion of this variant that for my taste is a magnificent candidate to be the next step in the evolution of chess. 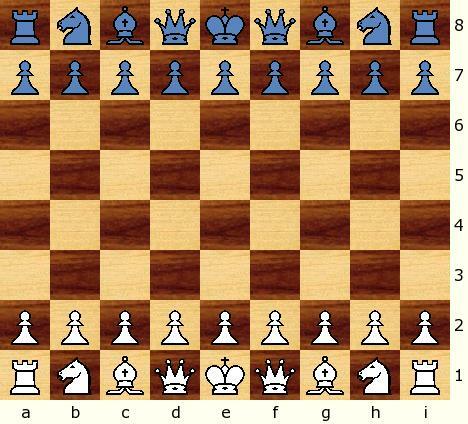 Same as in standard chess plus a queen and a pawn per side. 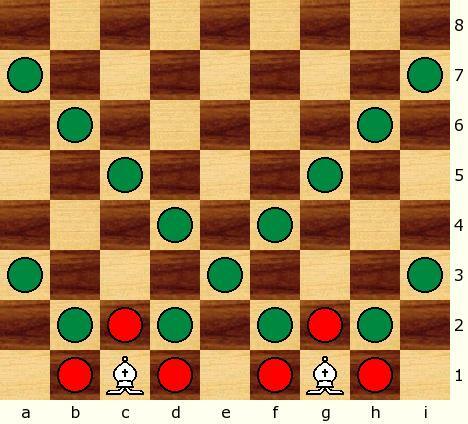 1) In castling king moves 3 squares towards either rook. 2) The Bishops Conversion Rule holds. 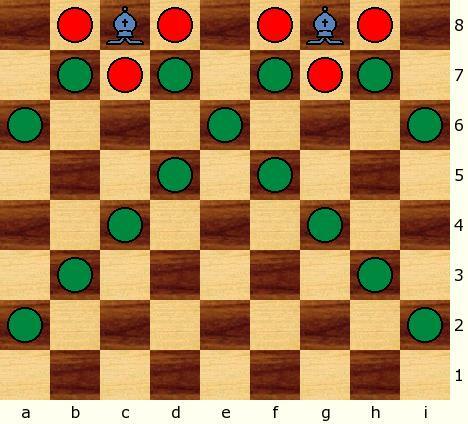 One of the two bishops of each player must change the color of the squares for which it will run. While in its initial position without having previously moved, it will give an orthogonal step towards any of the three squares surrounding it that are of the other color, provided they are empty. This move is called "conversion". A player may choose which bishop he converts, but if he makes a normal move with one of his bishops, the first move made with the other must be a conversion move; and, viceversa, if he first makes a conversion move with one of them, then the other will have to be moved normally. Thus, a player never can make more than one conversion move in a game, and a promoted bishop does not make conversion moves. It is possible to take a piece of the opponent by conversion. If both bishops are in their original squares without having been moved before and one of them is captured, then the other will retain the option of being converted or move according to the color of the square in which it is located. The following diagrams show with red circlets the squares in which bishops may be converted and with green those squares reached normally. Since the elements that form this variant are simply common notions of public domain [symmetry, 9x8 checkered board, standard chess pieces], clearly I am nothing but its promoter. With respect to The Bishops Conversion Rule, it is so logic and natural that I would not be surprised if someone else before me conceived it; I prefer it over other possible solutions for its simplicity as it does not involve more than the object itself subject of the problem. The interesting bishop's conversion rule makes this variant tricky to handle in the opening stages. On a 9x8 board, bishops are only clearly slightly better than knights, the development of which can also be tricky to decide on. The extra queen per side make this a variant rich in possibilities. My tentative estimates for the piece values of this variant would be: P=1; N=3.5 approx. ; B=3.75; R=5.5; Q=10.25 and the fighting value of K=3.5 approximately (though naturally it cannot be traded). Note that a N has slightly less excellent central squares on an empty 9x8 board compared to on a 10x8 board (in Capablanca Chess I rate also rate a N as worth 3.5 approx., but actually a little less than on 9x8 when not rounding to the nearest 0.25), but the 9x8 board being somewhat smaller seems to at the least offset this IMHO, as a N can have a slightly easier time getting from one extreme flank to the other.